This article will show you two different approaches on how to extract and edit the default control templates of the Telerik UI for Silverlight controls. Inside the installation folder of your version of Telerik UI for Silverlight you can find a folder named Themes.Implicit. It contains the XAML files of the different themes for all the controls. You then have to navigate to the required theme and open the needed XAML file with your favorite editor. For example, if you are using the Office_Black theme and you need the control template of the RadListBox control, you need to go in the Themes.Implicit\OfficeBlack\Themes folder and find the Telerik.Windows.Controls.xaml file which usually corresponds to the name of the assembly the control is located in. You need to extract the desired control template from the theme you are using in your application as there are differences between the templates in the different themes. Not using the correct template may lead to errors or cause undesired behavior. When you have the file open in an editor you need to find the default style for the given control. 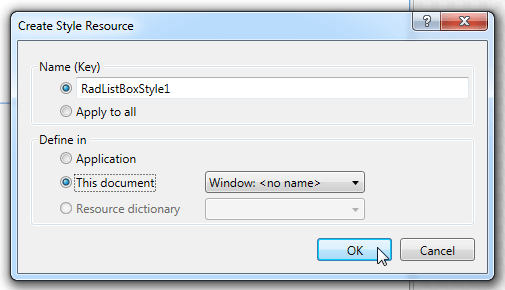 The default styles usually follow the convention name of the control + Style, for example - RadListBoxStyle. After you locate the style you have to navigate to the value of its Template property setter which will point you to the control template. Once you have copied the template you can easily modify it and apply it either to a single instance of the control or throughout your application by creating the appropriate style and setting its Template property. For example, if you want to add a rounded red border around the RadListBox control you need to extract the respective control template and modify it as demonstrated in Example 1. 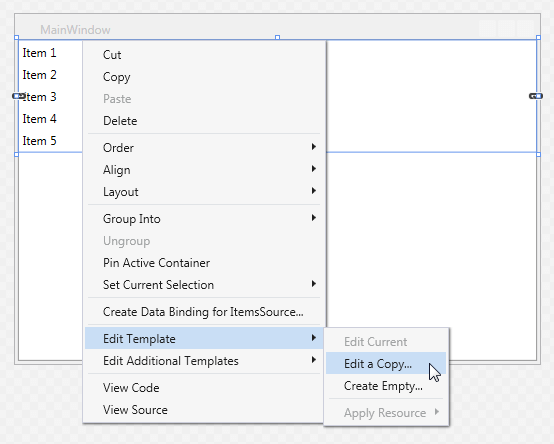 The other way to extract a control template is through the Visual Studio designer or Expression Blend. You have to right click on the desired control and navigate through the context menu to the Edit Template option. Afterwards just click on the Edit a Copy option as shown in Figure 3. The Create Style Resource dialog will appear, providing you with a few choices. 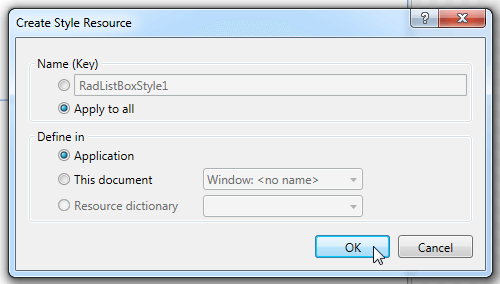 The first option is to extract the style with the default control template in a specified document with a resource key. You can choose this option if you need to apply it on a single instance of the control. The second option is to create an implicit style. Let's assume you just need to style one specific instance of the control and you have chosen to extract the style with a resource key in the current document. Example 2 shows the generated XAML code.